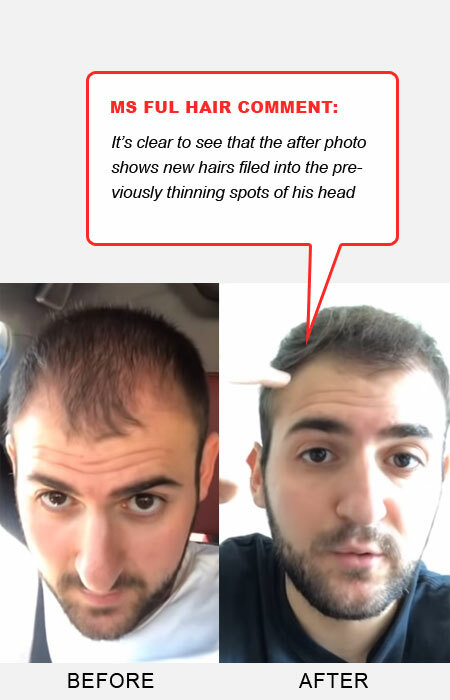 Today’s hair loss success story is from Reddit. 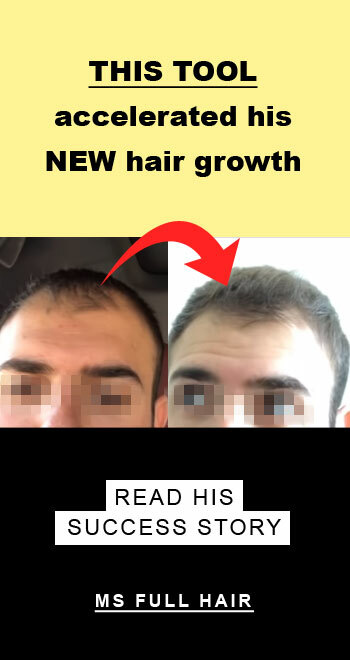 A user, who goes by medicineandsports, had an AMAZING before and after hair regrowth transformation using 3 classic hair loss products that you are probably familiar with. The before photo is from June 2018 and the after photo is from March 2019. While it took him about 9 months to see results, he reveals one thing that actually helped accelerate his hair growth. He suffered from typical male pattern hair loss (receding frontal line and thinning hair on the crown area). As he didn’t feel too comfortable using propecia (due to many reported side effects such as sexual dysfunction, etc), he decided to go with trying Rogaine – The only topical hair regrowth solution approved by FDA. He says that he applied Rogaine every night before he went to bed. He continued using it topically for the first 4-5 months and noticed it was helping with growth on his hairline and slightly on the vertex; however, he adds the overall density of hairs was becoming worse. He then decided to add a couple more things to his daily regime, mainly because of the worsening hair density issue he was experiencing even after Rogaine. Around December (6 months after he started his journey), he started taking biotin supplement. He says that it definitely made his hair thicker as well as his beard. You can see our TOP 5 biotin recommendations here. He took it once everyday. Around January, he also started micro-needling the bald spots using a derma pen in order to promote blood flow. A derma pen is similar to a derma roller. It’s a tool for applying micro-needling onto your scalp (it’s also popularly used for beauty purposes such as eliminating wrinkles and rejuvenating facial skin). By poking hundreds of tiny holes into the scalp, it’s theorized to stimulate much better blood circulation. You can read more about derma rolling for hair regrowth here. He decided to go with a derma pen instead of a derma roller (or even a derma stamp) due to concerns with the level of pain. He also says that since the derma pen has an automatic needle function that quickly goes in and out of the scalp, it made it easier to use and reduced the pain level (even though he admitted that the procedure was still a bit painful, but very bearable). Related Post: Toppik Reviews - How Well Does It Work for Thinning Hair? He emphasizes that micro-needling actually made a HUGE difference when it comes to promoting new hair growth in his case. He also adds that he couldn’t have made his video because, before micro-needling, his hair was still thin. While Rogaine helped him with the receding V line zone, his vertex was still so thin that his scalp was simply visible. He used the derma pen on his scalp for 10 minutes once a week. Nizoral has an active ingredient called ketoconazole, which contains an anti-fungal property. He is not sure if this really helped with hair growth or not, but notes that he has been using Nizoral shampoo for about an year or so. He uses Nizoral once or twice a week. Apply Rogaine to the thinning area of the scalp 6 times a week. Use a derma roller or a derma pen once a week. Apply the derma pen onto the thinning hair spots by moving the pen from left to right and front to back (in various directions). This will take about 10 minutes. Also, do not apply Rogaine on the day you use the derma pen. Take Biotin supplement once a day. How long to see results? He says he first started with Rogaine in June 2018. But the real hair regrowth started when he started using a derma pen as an addition, which was January 2019 (6 months later). He updated his final results in March 2019. So while the whole process took him 9 months, he was able to see visible new hair growth after 2 months of derma rolling onto the scalp. NOTE: He does it before he goes to sleep. While Rogaine is currently the only topical FDA-approved treatment for the purpose of stimulating hair regrowth, a lot of controversial opinions exist when it comes to its true efficacy. In this case, it partially worked in his favor for inducing hair growth on the frontal region, but ironically made things worse for the crown area of his head. He contributes his hair regrowth success to the addition of the micro-needling, which in a separate study reported 5 TIMES MORE hair regrowth. Get the latest news and reviews on hair loss + regrowth solutions. Toji Pure Density Vitamins Review – Does It Work for Hair Growth?